In addition to needing a new website, the sorority ladies also were looking to get their branding in line. Having just previously used their sorority crest for a logo, I wanted to set them up with a consistent look they could use everywhere online. I set to work in Adobe Illustrator to design a logo and a couple logo variations, along with a few decor pieces and custom buttons to be used throughout the website. We of course stuck with the sorority color, royal purple, and I pulled inspiration for the brand as a whole from one of their previous Rush Week t-shirts. The whimsical, free-spirit look of the t-shirt guided my vision for their brand. One feature I was sure to include in this site was a video banner background on the home page. You can view it on the live site here. 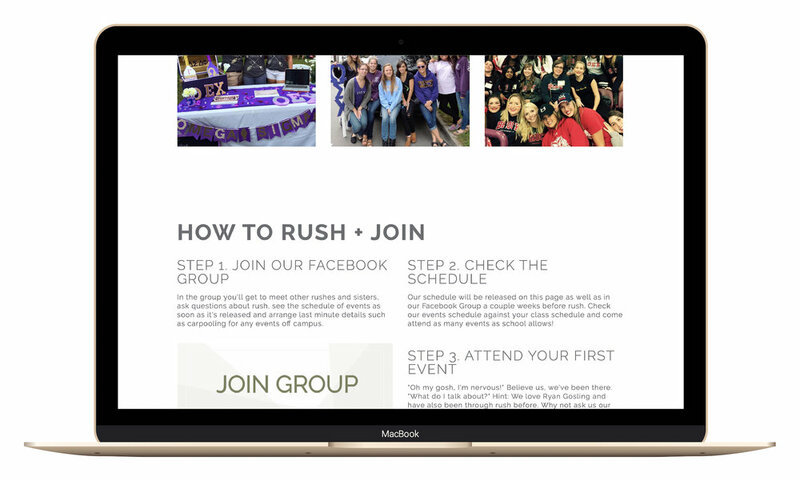 This new Squarespace feature was perfect for us to show just a little glimpse of the girls lives in the sorority front and center. If your organization is also looking for a stunning new website to display yourself in the best light online, then let's work together!